The harp is one of the oldest instruments in our history. The earliest evidence of the harp is found in ancient Egypt dating back to 2500 B.C. 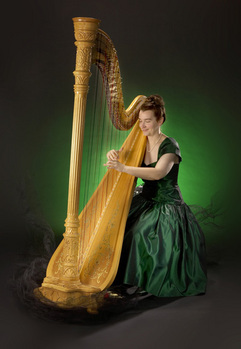 Harps have appeared in many forms throughout history and throughout the world. The harp has undergone many developments from its primitive forms to the modern day Concert Grand Pedal Harp. Famous harpists include King David who used to play his harp to soothe King Saul when the evil spirit came upon him; and Harpo Marx who wrote many compositions for the harp but never wrote them down due to his inabality to read music. The harp has remained one of the most enduring and outstanding instruments in our history. Today harps essentially fall into two categories: Pedal Harps and Non-Pedal Harps. Adrienne plays exclusively on a Concert Grand Pedal Harp. This style of harp has 47 strings and 7 pedals. The function of the pedals is to change the sharps and flats. This combination of strings and pedals allows the harpist to play in all keys, thus allowing for a greater breadth of repertoire. Additionally this type of harp has an extended sounding board which allows the sound to project and fill a room.